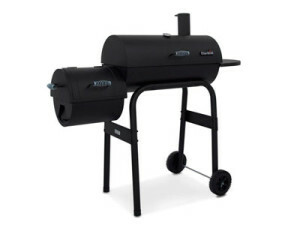 The Char-Broil Offset Smoker American Gourmet Grill is capable of performing two grilling or smoking jobs at the same time since it contains two cooking areas, the primary and secondary. Its cooking grates are coated with porcelain to resist on extreme high temperatures. It also includes an offset fire box which gives way to the indirect way of cooking food, maintaining and even enhancing the juiciness, tenderness and smoked flavor of the dish. The griller is very easy to clean and to maintain through the simple door and convenient side shelf compartment. To prevent flare-ups, corrosion, and rust, it is highly advised that cleaning should be observed well so as to further avoid any damages. Basically it is very easy to assemble with its sturdy construction. The side tables are perfect sections for preparing the dishes and others. The primary and secondary cooking areas are big enough to handle a full rack of meat or a number of burger. It is very efficient and effective. The food is well grilled or cooked considering that it is able to maintain its temperature. It heats up quickly and at the same time when it is off, it also cools off that fast. It was observed that heat comes off when the doors of the unit are opened and it does not come up with the desired regulated temperature. Grilling and smoking will take quite sometime due to this concern. The legs of the whole unit were not sturdy at all and what made it even worse was that it cracked. It might be that it has also something to do with the pins and the wheels are kind of weak. Alignment of its parts was a major concern. It was also noticed that there is peeling and leaking of the paint and the bags. Excellent Griller and Smoker in One! The griller-smoker in one is just so right especially when it is your first time to do job. Considering that it is filled with outstanding features, you will surely have a great time and experience and you will be longing to do it more often with your families and friends.